It’s a common occurrence that some items we buy become more and more obsolete as time passes. This is especially true for electronics gear since technology progresses so quickly. [Rochefoucauld] had a PSP that he didn’t use anymore and was trying to figure out what to do with it. Then one day in his basement shop while yearning for some tunes, it hit him: use the PSP as a media player. The PSP is actually not modified and uses the standard media player, it is the project’s execution that is interesting. Some old computer speakers were taken apart to harvest the amplifier. [Rochefoucauld] had an external hard drive that broke so he scavenged the sleek looking case and mounted the amplifier PCB inside. The speaker outputs were routed to terminal blocks mounted on the back of the case. The PSP now resides on a mount made out of a floor joist hanging bracket from the hardware store. The PSP and amplifier share the same power supply and master power switch. The whole unit powers a pair of bookshelf speakers. In the end, [Rochefoucauld] solved his lack-of-music problem with parts he had kicking around and is also now making use of his PSP that was otherwise collecting dust. For more non-traditional uses for PSPs, check out this status monitor or this extended display. Here’s [FlorianH’s] setup for driving a PlayStation Portable screen with an FPGA. He’s using the DE0-Nano board to do this, and the first order of business was to establish a way to connect the two. He did a great job of etching his own breakout board, which has some traces that are less than 10 mils thick. 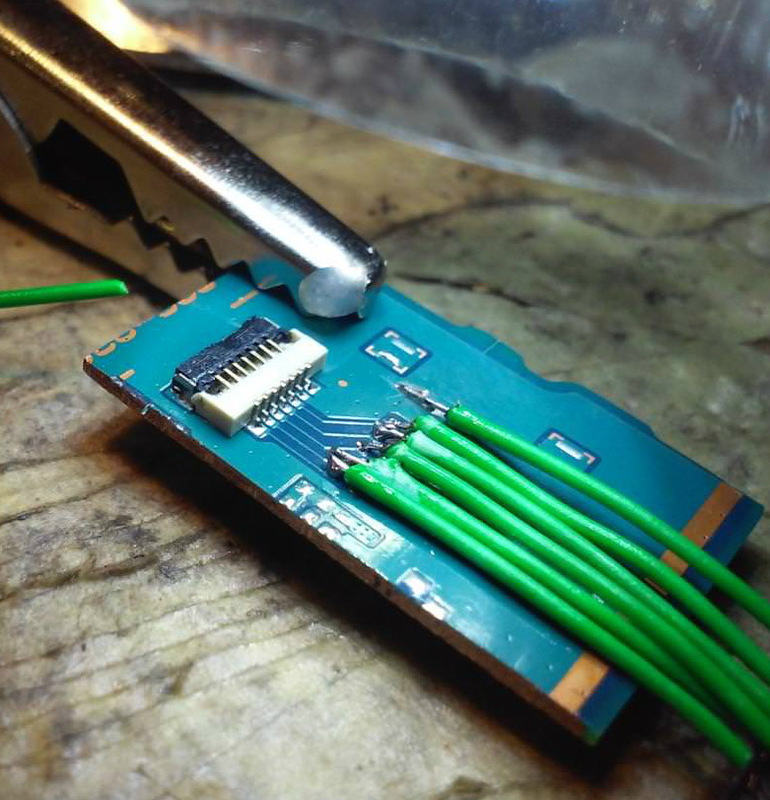 Soldering the connectors for the screen was a bit of a challenge, and he shared several pictures of the process for your enjoyment. With everything hooked up he fired it up with just a couple of lines of code to draw a test pattern. From there it was on to building a more intensive driver. [FlorianH] mentioned to us that he’s just starting to learn about FPGAs after having worked extensively with 8-bit microcontrollers. He’s been documenting his work on his site, and finds himself frequently referencing his own material so remember how he did things. Our vicarious enjoyment is an unintended (but welcomed) consequence of that habit. [Bacteria] retro console modder extraordinaire, is back at it with a rather massive project. “Unity”(originally Dubbed Alpha Omega), this will be a single unit that can play games from 20 different console systems. It will run from one power supply, have one video output, and strangely enough, one controller. [Chris Downing] was nice enough to tip us off to a video of the Unity controller in action. The controller isn’t quite as bulky as we would have assumed with the extensive list of consoles it has to support, but that could be, in part, due to the fact that you actually swap out the brains for the controller for each system’s compatibility. [Michael Chen] felt the sound his PSP was putting out needed more dimension. Some would have grabbed themselves a nice set of headphones, but he grabbed his soldering iron instead and found some space where he could add a bigger speaker. Mobile devices tend to cram as much into the small form factor as possible so we’re surprised he managed make room. But apparently if you cut away a bit from the inside of the case there is space beneath the memory card. [Michael] cautions that you need to choose a speaker rated for 8 ohms or greater in order to use it as a drop-in replacement for one of the two original speakers. But he also touches on a method to use both stock speakers as well as the new one. He suggests grabbing an LM386 op-amp and a capacitor and hooking them up. Yep, there’s room for that too if you mount it dead-bug-style. 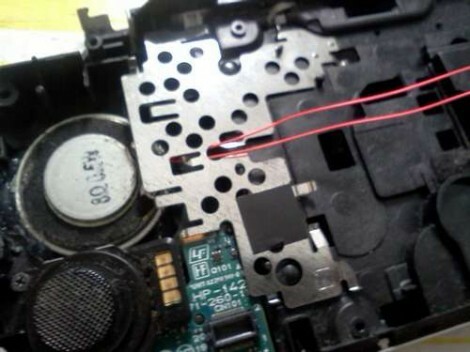 We wonder how the battery life will be affected by this hack?